"My father taught me how to make this quick and easy dinner for four. We usually eat this dish with rice and steamed green beans. Note: You can get the oyster sauce in this recipe at your local grocery store in the Asian food department." In a large bowl, mix soy sauce, oyster sauce, garlic, and pepper. 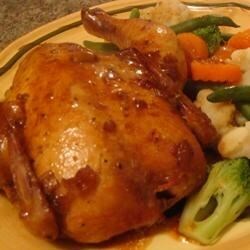 Place Cornish game hens in the mixture, and marinate 10 minutes. Transfer hens to a medium baking dish, and cover with the marinade mixture. Cover dish, and bake 30 minutes in the preheated oven. Remove cover from dish, and place 1/2 the butter on each hen. Increase oven temperature to 350 degrees F (175 degrees C). Basting frequently with the marinade mixture, continue baking 30 minutes, or until exterior of the hens is lightly browned and crisp, the interior is no longer pink, and juices run clear. Impress guests with these elegant hens—the perfect size to serve individually. This turned out okay. I thought it would have more flavor. It also took 10 extra minutes to cook. Probably won't make it again. So easy, and so good! I work nights, so the crockpot is my best friend. My family has a nice hot meal for dinner even when I'm not there...and this is so easy to do. The marinade for this dish was awesome! Hens were moist and very tasty, although, I think I will try the marinade on boneless chicken breasts. Very easy! Very good. You will be surprised. This was excellent.My husband who thinks that you only cook cornish hens on the grill was blown away.I wil make this again and again,Thank you.